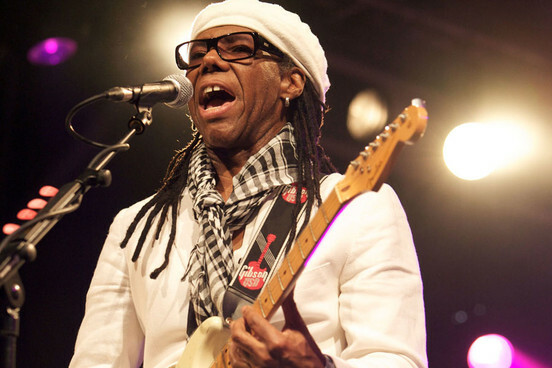 Nile Rodgers has hinted that his collaboration with Daft Punk will be released this year. In a blog post published on his website titled '2013 Won't Be Boring', the producer outlined his plans to play in Japan this year and then seemingly suggested that his project with the French electronic duo could be released in the next 12 months - and also included a photoshopped picture of him standing next to the enigmatic pair, which you can see atNilerodgers.com. "The next time I set foot in Japan, my collaboration with Daft Punk would have started to hit people's eardrums," he wrote. "As well as a number of songs I'm working on over the next few months with a select group of artists and, of course finally, my lost Chic and solo material. No matter how it ends, 2013 won't be boring!" In August last year, Rodgers spoke about his studio sessions with Daft Punk in glowing terms and claimed their new material was sounding as good as his best work with David Bowie or Madonna. The Chic man has a host of illustrious production credits to his name, and twiddled knobs on classic LPs including Bowie's 1983 album 'Let's Dance' and Madonna's 1984 LP 'Like A Virgin', as well as working with artists such as Duran Duran, Grace Jones and Diana Ross, but insisted: "All I can say is those guys are geniuses and to think that after all these years we've been trying to get together, they just show up at my apartment in New York City and the vibe between us is so powerful and so strong – it's unbelievable." He added: "Spiritually and artistically working with them was as good as anything I've ever done. It's as great as being in a studio with Bowie, it's as great as being with Bernard Edwards, and it's as great as the best stuff I've ever done with [Duran] Duran and Madonna." Earlier this week (January 3), however, rumours that Daft Punk could headline either this year's Glastonbury and Coachella festivals were quashed by Bestival organiser Rob Da Bank, who revealed that he had been informed through official channels that Daft Punk will not be appearing live at all this year.